Description: Mardome trade roof dome, fixed, with sloping kerb. Available in single, double & triple skin, in either clear, bronze or opal. Dimensions: 900mm x 900mm Vent Options (Trickle vent) Manual Vent (Hit & Miss vent) Auto humidity control vent All roof domes are manuf.. Description: Mardome trade roof dome, fixed, to fit builders upstand (unvented). Available in single, double & triple skin, in either clear, bronze or opal. Dimensions: To fit up to 900mm x 900mm Enter internal and external dimension. Looking down onto the upstand. All roof domes .. Description: Mardome trade roof dome, fixed, to fit builders upstand (Vented). Available in single, double & triple skin, in either clear, bronze or opal. Dimensions: To fit up to 900mm x 900mm Enter internal and external dimension. Looking down onto the upstand. Vent Options (Tri.. Description: Mardome trade roof dome, manual opening, (optional powered opening available) with sloping kerb. Available in single, double & triple skin, in either clear, bronze or opal. Dimensions: 900mm x 900mm Vent Options (Trickle vent) Manual Vent (Hit & Miss vent) Auto humidi.. Description: Mardome trade roof dome, manual opening, (optional powered opening available) to fit builders upstand. Available in single, double & triple skin, in either clear, bronze or opal. Dimensions: To fit up to 900mm x 900mm Enter internal and external dimension. Looking down o.. Description: Glass Mardome trade roof dome, fixed, with sloping kerb. With inner glass layer, polycarbonate dome. Dimensions: 900mm x 900mm Vent Options (Trickle vent) Manual Vent (Hit & Miss vent) Auto humidity control vent U Value 1.21 W/m2 K All roof domes are manufactured to or.. Description: Glass Mardome trade roof dome, manual opening, (optional powered opening available) to fit builders upstand. With inner glass layer, polycarbonate dome. Dimensions: To fit up to 900mm x 900mm Enter internal and external dimension. Looking down onto the upstand. Vent Options (Trick.. Description: Glass Mardome trade roof dome, fixed, to fit builders upstand (Vented). With inner glass layer, polycarbonate dome. Dimensions: To fit up to 900mm x 900mm Enter internal and external dimension. Looking down onto the upstand Vent Options (Trickle vent) Manual Vent (Hit & Miss .. 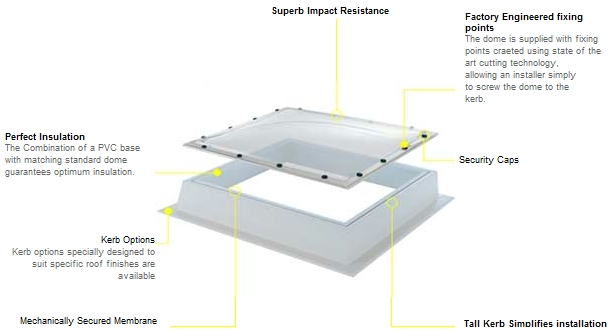 Description: Glass Mardome trade roof dome, fixed, to fit builders upstand (unvented). With inner glass layer, polycarbonate dome. Dimensions: To fit up to 900mm x 900mm Enter internal and external dimension. Looking down onto the upstand. U Value 1.21 W/m2 K All roof domes are manufactured.. Description: Glass Mardome trade roof dome, manual opening, (optional powered opening available) with sloping kerb. With inner glass layer, polycarbonate dome. Dimensions: 900mm x 900mm Vent Options (Trickle vent) Manual Vent (Hit & Miss vent) Auto humidity control vent U Value 1.21 W..